The Group of Twenty (G-20) remains the premier forum for international cooperation on global economic governance and finance. Representing a large chunk of the global economy (86%) and world trade (78%), it is not surprising that over time the Group’s mandate has expanded to address other issues. Through the different summits that have been held, issues ranging from development, environment and health have been included on the agenda. In addition to that, the adoption of the UN’s 2030 Agenda and the Sustainable Development Goals (SDGs) has required the G-20 to adjust its approach to development issues. This has resulted in the G-20 adopting a range of plans to contribute to the implementation of the SDGs. The G-20’s policies and plans have an impact on Africa’s overall economic development. As such, the participation of Africa in the G-20 process is crucial. South Africa is the only permanent member of the G-20 from Africa. It bears a huge responsibility in ensuring effective participation for its interests as well as those of the continent where necessary. Representative agencies who have an observer status, such as the New Partnership for Africa’s Development (NEPAD) and African Union (AU), similarly have a role to play. These African institutions have an opportunity for more effective participation now that there is space provided for greater participation by the NEPAD Agency and the AU Commission (rather than representation only through the rotating political heads of the organisations). The G-20 has stated that Africa’s development remains a priority for them. 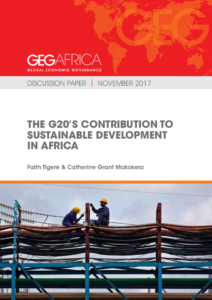 An analysis of the G-20 agenda indicates key issues are included that are of relevance to Africa such as infrastructure, food security and human resource development. Initiatives that have been introduced include the G-20 Energy Access Action Plan in Sub-Saharan Africa (Antalya Summit), Support for Industrialisation (Hangzhou Summit) and the G-20 Africa Partnership (Hamburg Summit). Bearing in mind that Africa’s economic development is also a priority for African states and the AU. The AU has developed its own Agenda 2063 – a strategic framework for Africa’s sustainable socio-economic transformation and integration to be implemented over a five-decade period. The agenda is summarised in six aspirations and still needs to be fleshed out to identify a concrete set of objectives. A comparative analysis of the AU Agenda and the UN 2030 Agenda shows there are significant overlaps between the two agreements. These overlaps include the objectives of poverty alleviation, achieving food security, full access to education, sustainable development, achieving sound health and wellbeing, and achieving gender equality in all spheres of life. As the UN SDGs and the AU Agenda are aligned, it becomes easier to incorporate developmental issues in the G-20 agenda. The G-20 has indicated a commitment to the UN SDGs and some goals have been explicitly incorporated into the agenda. For example, the goal to alleviate poverty has seen support from initiatives such as the G-20 and Low Income Developing Countries Framework (Antalya Summit), Good Practices on Family Farming and Smallholder Agriculture (Hangzhou Summit) and the G-20 Initiative for Rural Youth Employment (Hamburg Summit). Through the work of the G-20 Development Working Group (DWG) , a level of continuity in terms of African objectives is ensured. The main objective of the group is ensuring the consistency with the G-20 framework, engaging developing countries, and focusing on tangible outcomes for low-income countries to mention just a few. The original agenda for the DWG was agreed in the Seoul Declaration and included infrastructure, trade, human resource development, food security, financial inclusion, private investment and job creation, growth with resilience, domestic resource mobilisation, and knowledge sharing. Ensuring that the representative agencies at the G-20 are fully resourced and supported. A close cooperation by all the different countries to implement the SDGs to ensure that no one is left behind. Prioritising areas where there is a significant overlap between the G-20 initiatives, DWG and the UN SDGs. Implementing G-20 commitments that support the SDGs and African development. Bridging the gap between existing initiatives and to build linkages across different initiatives by the different summits. Encouraging international finance institutions to embed the SDGs in their work. Promoting capital flows from surplus countries to profitable opportunities in sustainable infrastructure and climate finance. These are just some of the recommendations made to fully reap the benefits of the G-20. South Africa as a permanent member could also identify some focus areas that it could prioritise and seek to obtain tangible results. In addition to that, South Africa could continue with a balanced approach to the three dimensions of sustainable development (economic, social and environmental) and specify contributions towards both the environment and the social dimension. Our most recent paper on the G-20 explores these issues in more detail and makes additional recommendations for the engagement of African policymakers with the G-20.